What Do Teenagers Think About E-Books? Not Much. Would you trade your textbooks for e-books, asks the New York Times Learning Network of students 13 years or older. The responses are all over the map depending on whether they're reading for school or for pleasure. Anecdotal quotes like those below are predominantly against e-readers, from what seems to be kids who haven't had much experience with the gadgets. As I've said before about college students preferring print over digital, I think it goes back to a person's formative experience when it comes to reading. If you grew up reading print books, which most of us have, we'll tend to stick to what we know unless we're early adopters of new technologies. A print book only requires opening, reading, and bookmarking with a folded edge. E-readers have a learning curve that requires some time to adjust. But kids learning to read today on e-readers and educational apps will have a different answer to this question than those below. "I like the idea of using an iPad, but I think kids will find a way to play around with it and they won’t focus on their work. 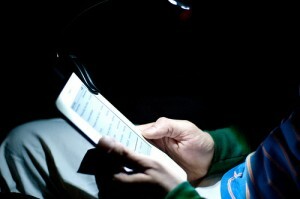 E-books will change education, but in some ways for the worse." "Digital books can be helpful at times, but they also hurt your eyes after awhile, like looking at a computer screen too long. I’d rather be turning the pages and using sticky notes to make notes, none of which you can do on a digital book." "Not many people like using computers too much and I’m one of them." "Textbooks are a good idea to have on digitally but not leisure reading books. Textbooks in our school are low as it is in numbers, so we read on the screen. That is the only time that I will accept a digital book." "Too many things could go wrong with it. Like dead batteries, or something wrong inside of it. I think I will stick with my paper books. Like in a way I would like to use an iPad, but I do not know how well that would end up." "If it was a book I wanted to read for leisure, I would prefer a hard copy." "Staring at a book for hours probably isn’t that good either, but a screen is always worse. I also feel like I retain less information if I’m reading from an online textbook. It’s just kind of distracting." "Personally, I do not own any e-books or machines that convert paper books to online versions. When I read textbook assignments online, I tend to associate it with social networking sites like Facebook or even long emails." "I think if I could hear it, and watch the examples given on a screen, that it would be a lot better. I think it would be better for my learning ability. and it might make things easier to learn by." "I would actually want to try the digital version because since kindergarten I have always had the printed books. I know it will not be something that I am used to but I would like to try it anyway." "That would be much easier to keep up with. Also it wouldn’t get ripped or anything like paper books do." "If I do read a textbook, yeah, it’d be cool for all of them to be in one little device that was lighter and smaller. It’d also be nice if I could hook it up to headphones and it’d read it to me, I might actually be able to learn."